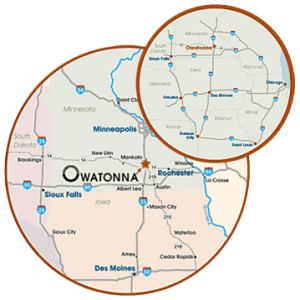 A highly trained workforce and location near major metropolitan centers are why businesses locate in Owatonna. Available properties provide immediate options. Owatonna is strategically placed at the crossroads of I-35 and two major US highways, giving it one of the most accessible locations in the Midwest. US Highway 14 connects half the employment centers in Southern Minnesota and three-quarters of the top employers. This thriving regional center serves as a shopping, tourism and healthcare magnet for southern Minnesota. It consistently ranks among the most livable small towns in the country. Owatonna Partners for Economic Development builds on the strengths of five organizations to meet the development needs of existing and locating businesses. Partners work together to coordinate services, accommodate requests and fast-track decisions.